When you’ve had three hours sleep, relatives are banging down the door at every hour of the day and you have a two-week old in tow, the last thing you want to be worried about is work! This is an all-too-common theme for new mums and dads. So what can workplaces do to make the transition to parenthood easier for their team? We were honoured to be included in Cosmopolitan’s Best UK Companies for Maternity Leave list last week. 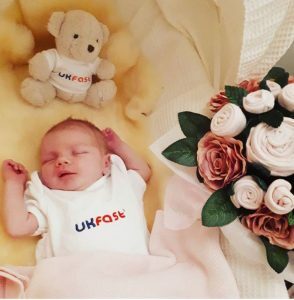 At UKFast, we really do try to do everything we can for our team, in so many ways, and new parents are high on that list. We also offer flexible working hours around school and nursery pick-up times as well as a range of parent get-togethers like Babies, Bumps and Sugar Lumps for new parents to chat over fancy cakes while the kids play. Childcare during the school holidays is a big issue with any team. Our Star Code Clubs, for ages 5-15, are really popular during half-term. These sessions are led by our team of education professionals and IT apprentices, giving young people the chance to learn how to write algorithms, code and gain a great insight into the world of tech. 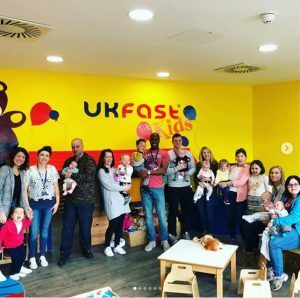 UKFast CEO Lawrence Jones MBE and Managing Director Gail Jones have four children together and know the troubles associated with finding childcare. Lawrence and Gail have worked hard to put together a comprehensive maternity and paternity offering which means that new parents have a smooth, happy return to work. New mums and dads should never need any extra worry in their lives, and we’re so happy to help you spend more time with the ones you love!